Productiv' You meets The Productive Woman - Productiv' You! Great news! 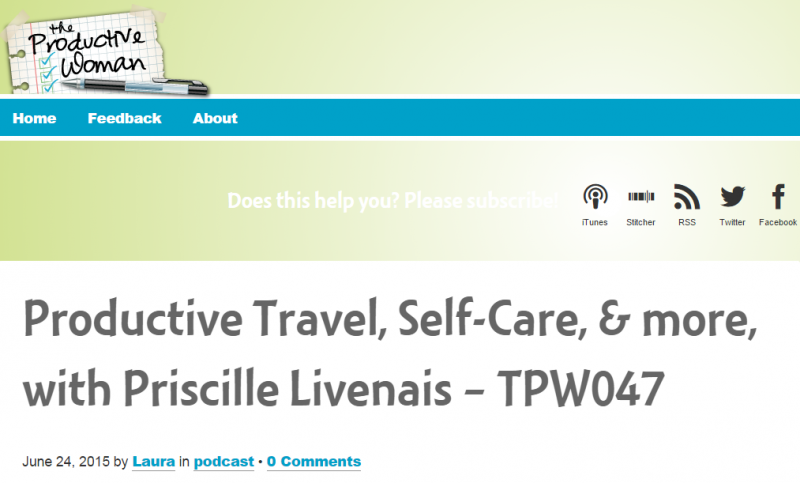 I was recently interviewed by Laura McClellan, the hostess of the great Podcast “The Productive Woman”. “The Productive Woman” is an exceptional Podcast, led by a woman with a big heart. Laura is a mother and business woman, blogger and writer. She knows the challenges that moms and moms who work outside, are facing daily. Her words go to the heart because they are simple, frank, humble and especially meaningful. I discovered her Podcast when I was doing a small study of “competition” before launching my own. And it was “love at first sight” because we share an approach to productivity and efficiency, we are on the same page. So I commented some of her episodes, via her blog http://theproductivewoman.com/. There followed a series of exchanges, contacts via Linkedin and Facebook and Laura was kind enough to allow me to be a guest on her show. I cannot tell you the state I was when I read her proposal !!! OMG, truly a Zebulon. After a first conversation to determine if my poor English would be good enough, we recorded a podcast last weekend !! Here you will find the episode. I share with her my typical day, my main challenges, the things that sometimes give me a hard time on the way to personal effectiveness, such as difficulty saying “NO”, staying productive when you travel frequently and my tips to get through periods where everything is getting away from me. For the english listeners, I apologize in advance because my english is rather poor and my accent terrible !!! And I highly recommend that you subscribe to her podcast, you will find great advice and real experiences.